Following Petra's recycled garment, this is what I created modelled by Petra (we played swapsies!). 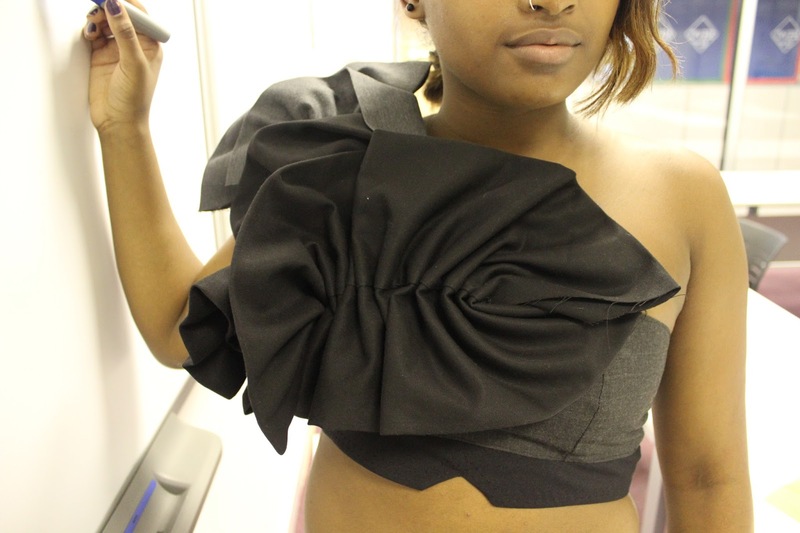 I made a crop top made from men's suit trousers. 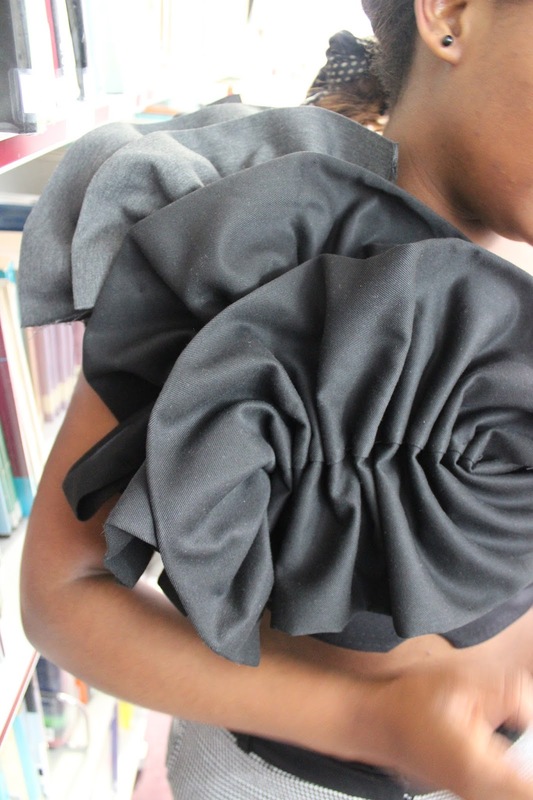 To create the actual bodice I adapted a prom dress pattern and cut from trouser leg material and lining. I used a waistband from a pair of trousers and flipped it upside down to produce the black band at the bottom to finish the edge. 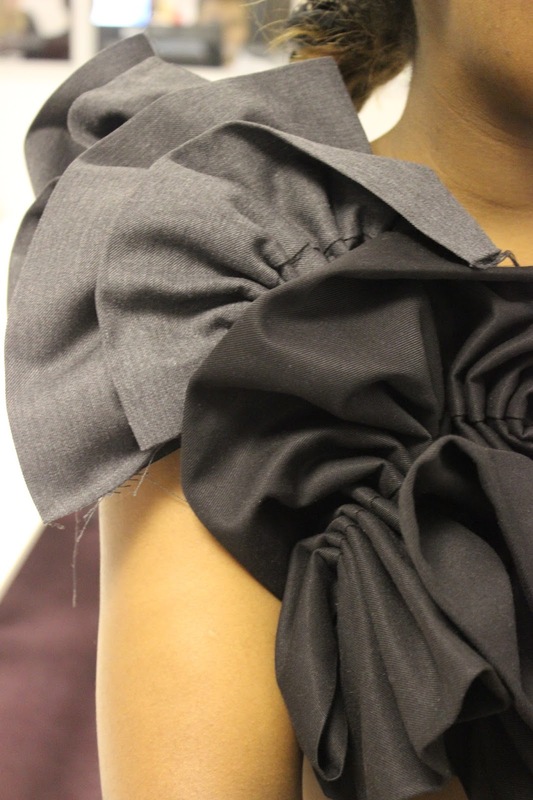 I made the bodice with one strap so that I could create a feature piece. Gathering a whole trouser leg created a lovely sturdy effect and worked well with the fabric, I created several of these and attached them onto the strap. To keep the garments structure I used a metal zip, I decided to keep this on show so that it acts a decoration as well as being functional. Overall I'm really pleased with how this garment turned out, I've managed to produce a well constructed garment from reused materials. To extend this piece, I could continue using gathered trouser legs to create a skirt, this would give a really intriguing waterfall effect. Again If you want to see this garment up close, Petra will be modelling it at the Re-think Rubbish Fashion Show held at Rayleigh Mill in Essex on the 30th of October. 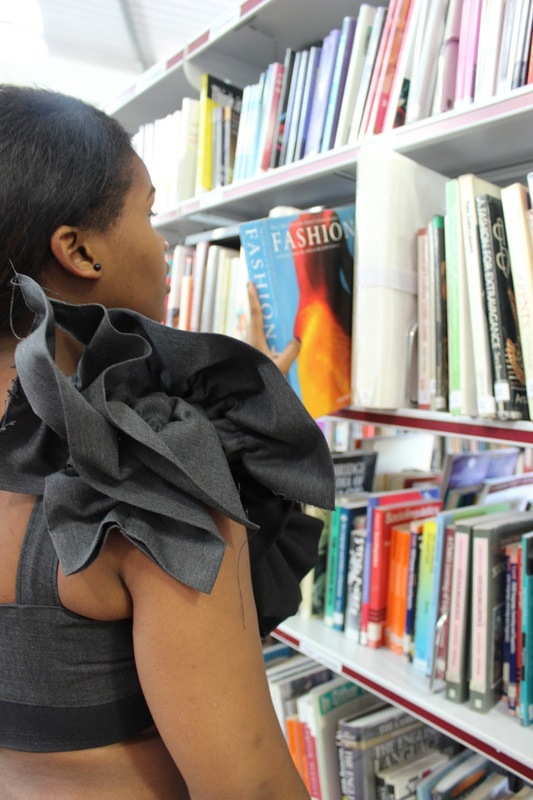 What recycled fashion have you seen? 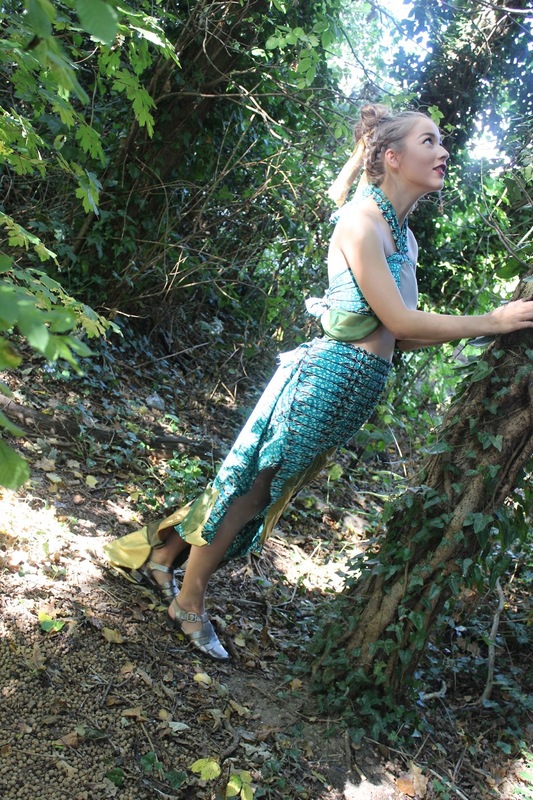 Hi everyone, just thought I'd show you some pictures of me modelling my friends(Petra Denis) recycled fashion garment. 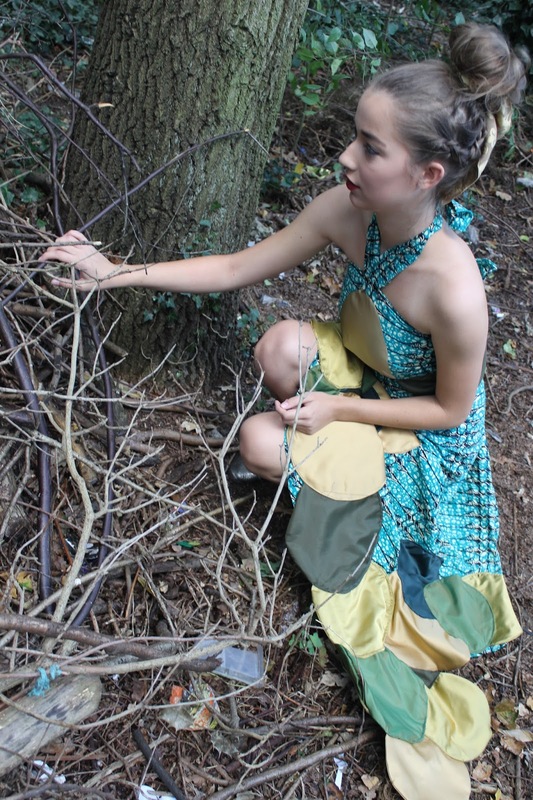 The garment is based on the theme of 'Africa' and is composed of old curtain material. 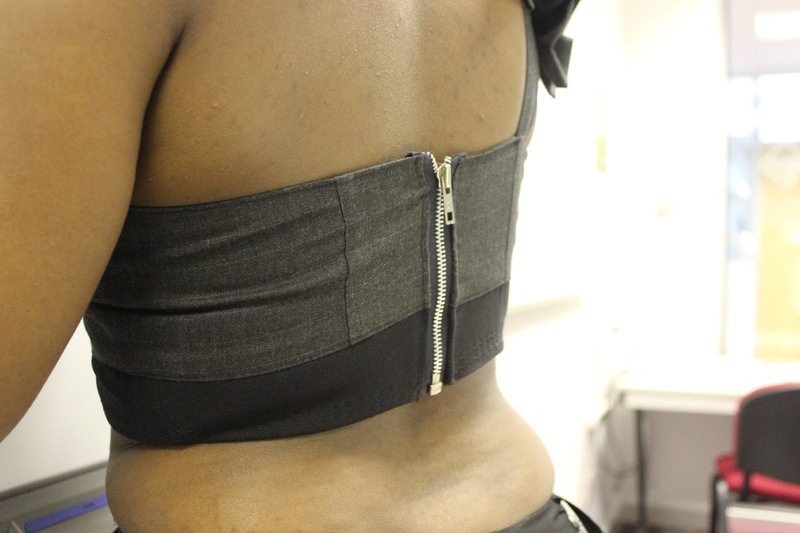 My favourite thing about the garment was the short train made from several circles, it is a really nice design feature and included natural earthy colours that suited her theme well. If you want to see this garment up close, I will be modelling it at the Re-think Rubbish Fashion Show held at Rayleigh Mill in Essex on the 30th of October.